The headline says it all. I broke my number one rule. I touched the hot stove even though it had burned me before. So I’ll say it now: I’m sorry, Patriots. I’m sorry that in a moment of weakness I doubted you and actually believed in the Chargers. Don’t worry, it won’t happen again. What I also hope won’t happen again is a week as bad as the one I had last week. I was 0-4, losing the two NFC games by a combined three points. Such is life. That said, this should be one heck of a championship weekend. New England goes for its ninth AFC title in the Brady-Belichick era, and its 11th overall, which would extend its own NFL record. In the way of the Patriots are the Chiefs, who only have homefield advantage here because of the Miami Miracle. Something tells me the Patriots have not forgotten that. Patrick Mahomes and the Chiefs are fun to watch on offense, but Mahomes even admitted this week the Patriots gave him looks he’d never seen before in his team’s 43-40 loss to New England in Week 6, and you can bet he’ll see more of those on Sunday at frosty, potentially-sub-zero Arrowhead Stadium. That will be in stark contrast to the NFC title game, which will be played in the warm and surely raucous Superdome. The Saints survived a massive scare last week, falling behind 14-0 to the Eagles and their magical QB, Nick Foles. But as they’ve done all year, the Saints simply found a way to win, which is why I love their chances to go all the way this year. Drew Brees and Co. carved up the Rams defense in the first meeting, and while I wouldn’t expect another 45-point output, I do think this Rams defense can be had. But what about the other side of the ball? C.J. Anderson has added a new element for the Rams, and their rushing attack with a now-healthy Todd Gurley looks as potent as ever. That will pose a big challenge for a Saints defense now without the services of stud defensive tackle Sheldon Rankins. I do believe the Saints will once again find a way, especially at home. New Orleans is unbeaten at home in the Sean Payton-Drew Brees era, and this Saints team is sick and tired of losing playoff heartbreakers like the Minnesota Miracle, Vernon Davis’ catch, and the Marshawn Lynch run heard ’round the world. The difference here could be one turnover, and I think Jared Goff is good for it. L.A. showed some fight in erasing a 21-point deficit in Week 9, and while I don’t expect them to get that far behind, I think that was more indicative of things than their almost-comeback. 18 years ago, Aaron Brooks led the Saints to the franchise’s first-ever playoff win against the St. Louis Rams, 31-28. I believe we’ll get a similar result and a similar score here. Prediction: Saints 31, Rams 24. You already know where I’m going with this. There are a million little numbers that I believe point to the Patriots winning this game, and whether or not you align with my so-called “conspiracy theories,” I’m going to throw them at you anyway. New England has lost three straight road playoff games (! ), a remarkable number given this franchise’s 21st Century dominance. All three of those have been AFC championship games against Peyton Manning-led teams, but I think the Chiefs are the perfect patsy. I can’t for the life of me imagine Tom Brady losing four straight AFC title games on the road and falling to 3-5 away from Foxborough, even though 3-5 is the Patriots’ road record this year. This more recent Patriots core, although it doesn’t give itself many opportunities, is long overdue for a road postseason win. This is a late kickoff, and the Chiefs are 0-4 in primetime this year. Keep in mind that entering this season, home teams have won 10 straight conference title games. The last to lose? That would be the Patriots in 2012, and I don’t see them being unlucky No. 12 (assuming New Orleans wins). After all, is there anything unlucky about the No. 12 in Boston? The weather will be a major factor and help slow down this so-called unstoppable Chiefs offense, and New England’s defense will force Mahomes into at least one critical game-breaking mistake. Kansas City’s defense looked better last week against Indy, but it’s a far cry from the suffocating Broncos defense that shut down the Patriots in their last AFC title game loss in 2015. Andy Reid is very untrustworthy with clock management, most recently evident in the Chiefs’ 27-20 loss to the Patriots in the 2015 divisional round. Reid is 2-6 against the Patriots, including 0-2 in the postseason. If the Chargers couldn’t make the third time a charm in the playoffs against the Patriots, what makes you think Reid can? You might want to scrap that fun little comparison I had to the 2013 season, because once again, Mahomes is a young, second-year pro, not the seasoned vet that Manning was. As much as I want to believe in the Chiefs’ ability to adjust to the Patriots from their second-half almost-comeback in Week 6, I still can’t shake that Kansas City still never really stopped the Patriots at any point in that matchup. New England can go 55 minutes playing average or even below-average football and hang around just close enough to come back and win, so I believe the only chance for the Chiefs is to basically blow the Pats out of the building. That seems so unlikely, though, and as we all know, not even a 25-point, late-third-quarter lead is safe against this team. It feels like America is due for a Brady-Brees showdown, a signature moment for two 40-somethings to outduel the young guns to reach the big stage. This would also be a perfect full-circle moment of sorts for the Patriots, as it was their 41-14 blowout loss at Arrowhead in 2014 that coined the now-famous “We’re onto Cincinnati” quote. Clearly, that was not the end of this dynasty as some people were foolish enough to believe. A win would put Brady 19 games over .500 in his postseason career at 29-10. That’s symbolic, as that 19 should put to rest any debate about whether Brady isn’t actually better than his childhood icon, No. 19 Joe Montana. 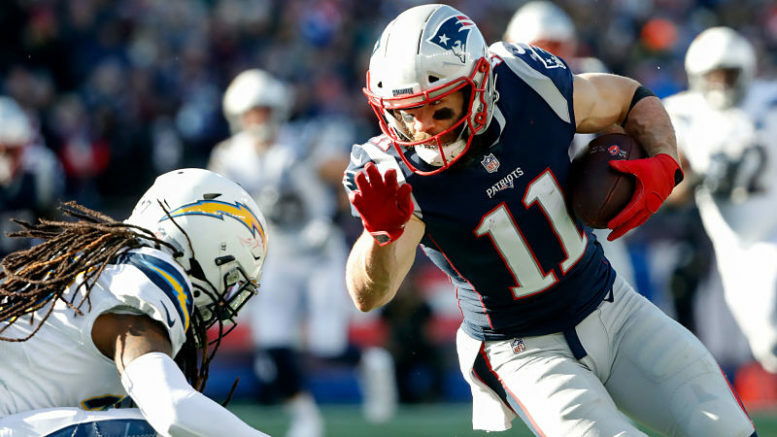 Julian Edelman will have another monster game to make amends for missing all of last year and the first four games of 2018, and Stephen Gostkowski has his Adam Vinatieri moment in this game and his right foot sends the Patriots to Atlanta with a last-second boot. Prediction: Patriots 34, Chiefs 31. Be the first to comment on "Championship Round: With Apologies to the Patriots"